Paul Revere's midnight ride looms as an almost mythical event in American history - yet it has been largely ignored by scholars and left to patriotic writers and debunkers. 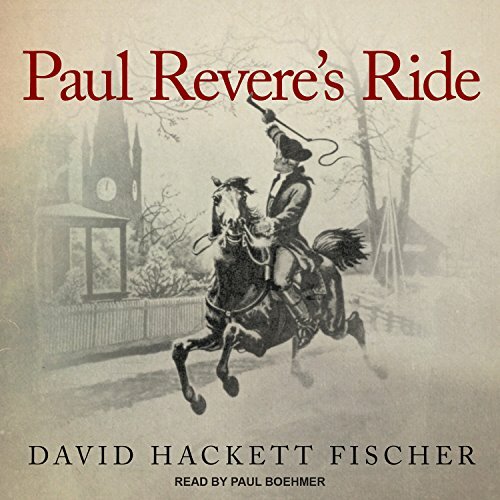 In Paul Revere's Ride, David Hackett Fischer fashions an exciting narrative that offers deep insight into the outbreak of revolution and the emergence of the American republic. Beginning in the years before the eruption of war, Fischer illuminates the figure of Paul Revere, a man far more complex than the simple artisan and messenger of tradition. When the alarm riders took to the streets, they did not cry, "The British are coming", for most of them still believed they were British. Within a day many began to think differently. For George Washington, Thomas Jefferson, John Adams, and Thomas Paine, the news of Lexington was their revolutionary Rubicon. Paul Revere's Ride returns Paul Revere to center stage in these critical events, capturing both the drama and the underlying developments in a triumphant return to narrative history at its finest.